Rep. Collins is the primary sponsor of the Regulations from the Executive in Need of Scrutiny (REINS) Act, H.R. 26. Although the regulatory state has been out of control for many years, it became increasingly concern during the Obama administration, which finalized an average of 81 major regulations -- those with an annual economic impact of $100 million or more. Under the Congressional Review Act (CRA), Congress can cancel a regulation through a resolution of disapproval. Prior to the 115th Congress, the CRA had been used only once to cancel a regulation. The CRA has seen historic use in 115th Congress, however, with Congress canceling 14 regulations issued during the final days of the Obama administration. The CRA, however, needs an upgrade. The REINS Act, which passed the House in January, would require Congress to approve a major regulation within 70 legislative days of its submission to Congress. Once approved by Congress, the resolution would be presented to the president for his signature. The REINS Act is a step toward restoring the lawmaking power given to Congress in Article I of the Constitution that overreaching regulatory agencies have been given through the growth of the executive branch. With his experience as a pastor and jurisdiction in the Judiciary Committee, it makes sense that Rep. Collins is supporting conservative justice reform. Rep. Collins sponsored the Prison Reform and Redemption Act, H.R.3356, which has been referred to the Subcommittee on Crime, Terrorism, Homeland Security, and Investigations. This bill outlines the successes we have seen in conservative states like Georgia and Texas on smarter sentencing. Currently, taxpayers are not getting a return on investment when it comes to our justice system. It is time for sensible, cost-effective policy that makes public safety a priority. According to the Bureau of Justice Statistics after tracking over 400,000 offenders the study found that within 3 years 67.8 percent reoffended and in five years 76.6 reoffended. Our current system is badly in need of reform, and this bill would use evidence based solutions by implementing needs based risk assessments in the federal prison system. Using recidivism risk reduction programming that has worked on the state level, this bill would allow private public partnerships including educational institutions and nonprofits to focus efforts on implementing incentive programs that would help transform the lives of the most vulnerable in our society. Recently, Rep. Collins introduced the Sunshine for Regulations and Regulatory Decrees and Settlements Act, H.R. 469. This legislation would improve transparency and codify plans put in place by EPA Administrator Scott Pruitt to address the practice of “sue and settle,” through which the EPA has previously promulgated regulations as a settlement after the filing of a lawsuit by radical environmentalist groups. Holding agencies accountable by requiring publication, responsiveness, and online comment through an open comment period within 15 days of “sue and settle” cases would expose what is happening behind the scenes. His directive also requires all actions that attempt to or delay agency action on any regulatory process will be made public. Often times special interest groups and federal agency litigation happens behind closed doors. Eliminating room for potential cronyism in this regard is of high priority for EPA Administrator Pruitt. Congress is determined to make rulemaking process decisions along with ensuring transparency; this bill would also ensure permanence in law making it difficult if not impossible for the next administration to undo. This is a step in the right direction and works hand in hand with plans set forth by the EPA Administrator Scott Pruitt as he plans to make the EPA as cost-effective, efficient and transparent as possible. Rep. Collins has a lifetime score of 84 percent on FreedomWorks voting scorecard. This score reflects the members voting records with issues FreedomWorks activists care about. Rep. Collins has supported sound public policy on regulatory, criminal justice reform, and many other issues. 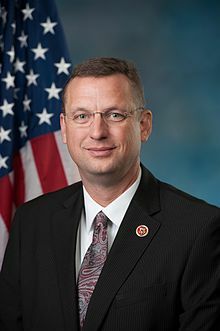 FreedomWorks is proud to name Rep. Doug Collins as Member of the Month for November.